Firm Profile - The Portfolio Group, Inc.
Overview. The Portfolio Group was founded by Steve and Betty Nickel in 1988 as a Design-Build firm. As such, the great majority of our projects utilize an "integrated" approach that delivers design and construction services managed by a single point of responsibility. We have specialized in, and have achieved, the design of award-winning "Vernacular Mountain" Residential Projects. Thankfully, we have had considerable success in bringing our clients' mountain house dreams to life. We are able to build what we design. This provides exceptional cost information during the design process, and it insures that the many mountain home features we design get executed as intended. Our Philosophy. As described above, we are a Design-Build firm committed to the creation of one-of-a-kind houses and related projects. We believe there is a strategic advantage to combining design and construction for client-specific, award-winning projects. We accept and thrive on the condition that no two projects or clients are alike. As much as our past experience can inform our work process, we must always start each new project with a clean slate and open mind. As such, both in Design & Construction, we are generally facing, and successfully executing, many ideas for the first time. Design. In the design phase, we start with you and your site; your "wish list"; the challenges and opportunities of your lot; and the images of the dream house that are in your mind. This is an open dialogue where we work with you to explore and discuss the architectural direction your home should take. We work with our extensive magazine files and any pictures and ideas you may have in order to understand the "look" you are after. We are very invested in insuring that each client gets a "one-of-a-kind", highly-styled and personal design. 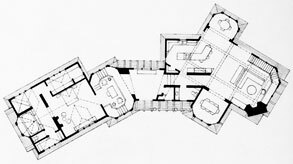 The "process" here includes 1/4" = 1'-0" scale drawings of concept floor plans, followed by conceptual drawings of exteriors and other drawings to communicate a suggested design direction. 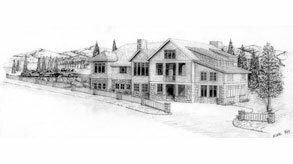 (See Green & Greene I, Greene & Greene II, Tip Top Ranch and Current Windcliff Townhome Project for examples of these drawings. 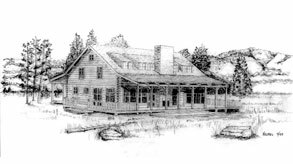 The Greene & Greene I page in particular demonstrates how design drawings accurately represent how the built project actually looks on completion.) These may not be final or complete solutions, but ideas from which a solution will arise. Sometimes these first ideas are the catalyst for a new or modified design direction. It is our position that concepts be explored and refined until the client is satisfied that objectives are met. This is the "back-and-forth" in the process that achieves a design that far surpasses our clients' expectations. During these design phases, we also begin to develop preliminary budget numbers, as a first step in assessing whether your cost objectives can be met. 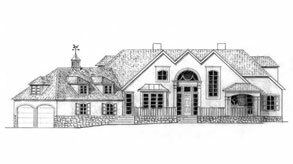 Because Portfolio also operates as a custom home builder, we are ideally positioned to do this. The final steps in our design phase are the completion of the "working drawings" needed for a building permit, our bid-for-construction, and a separate proposed contract for construction. Construction. At this point, clients are free to engage another builder. However, our experience has been that at this point we have forged a successful relationship, and often clients do not seek other bids. Those who do usually return to us for construction. We can only survive on a history of well-designed projects that are of acceptable value to our clients. During construction, our carpentry subcontractor acts as lead carpenter and on-site project contact. Betty and Steve Nickel lead other project management work such as fiduciary responsibility, site visits (up to 2-3 per day), supervision of subcontractors, product and material selection, sourcing, etc. The principals of Portfolio are in constant contact during critical construction steps to insure the project is built as designed and also to reconcile limitations in the most detailed of construction drawings with the realties of "the field". Our services are comprehensive, from excavation through to final cleanup for client move-in. We believe our construction quality is second-to-none in the Estes Valley. We specify the most premium products and construction materials, and we employ the best subcontractors available in the Estes Valley. Exterior and interior appointments reflect the craftsmanship, finish quality, and character of the leading magazine photos reviewed during the design phase. Inevitably, these quality considerations yield projects which are not "least cost" but rather are in the very highest tier of value. We thank you for your interest in The Portfolio Group.